Vieste, the further eastern city of the promontory of the Gargano area is built on a peninsula with two land ends: Punta San Francesco and Punta Santa Croce. The first of rocky nature is where the first settlers of Vieste established. It has the typical structure of a town of the Middle Ages with alleys, squares and stair cases. In this part of the centre the Cathedral and the Church dedicated to Saint Francesco were built. The urbanization of the Punta Santa Caterina, instead, is of the '800, here found space the Town Hall, the municipal Park and a large port from where it is possible to find ferry connections towards the Tremiti islands and Croatia. South of Punta San Francesco, where the rocky area ends and the old city was built, the large sandy beach of Pizzomunno finds space. Pizzomunno is a monolith, approx. 25 metres high and emblem of the city, on which there are various legends. On the other side of the city towards West of Punta Santa Croce, there is another long sandy beach, known as beach of Saint Lorenzo. The population dedicates most of the year in agriculture and fishing activities; famous are the "trabucchi", small wooden houses built on shafts with long jibs that hold large fishing nets. This fishing tradition finds its roots from the techniques used in the Gargano area, more than those of the Region Molise and those of the other areas of the same Region Apulia. Since the '60's the major resource of the local economy is tourism, with its campings in the pine woods and its Family runned hotels. 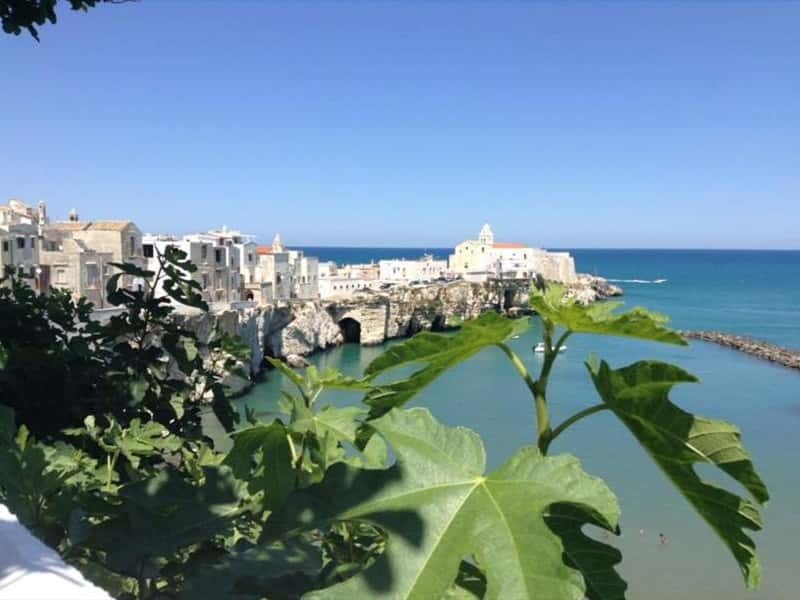 Vieste offers wonderful views over its coastline and offers a well-organized departure point for memorable excursions towards the Tremiti Islands and the Umbrian Forest. The city has a tormented history, due to its easy access from the sea. Two depredations with executions and deportations are remembered: one in 1242 on behalf of the Venetians and the other accomplished by the Ottoman leader Dragut Rais in 1554. Of its difficult history there are remains in the Castle and the Cathedral, partially destroyed during the incursion of the Venetians and rebuilt by Federico II of Svevia, who took to heart the destiny of this city. There are also traces of the anthropological era in this strip of land of the Gargano area; such as the tombs of the Iron Age found near the Castle and the Paleocristiano necropolis like the famous one of S. Nicola in the Pantanello district. This town web page has been visited 24,805 times.